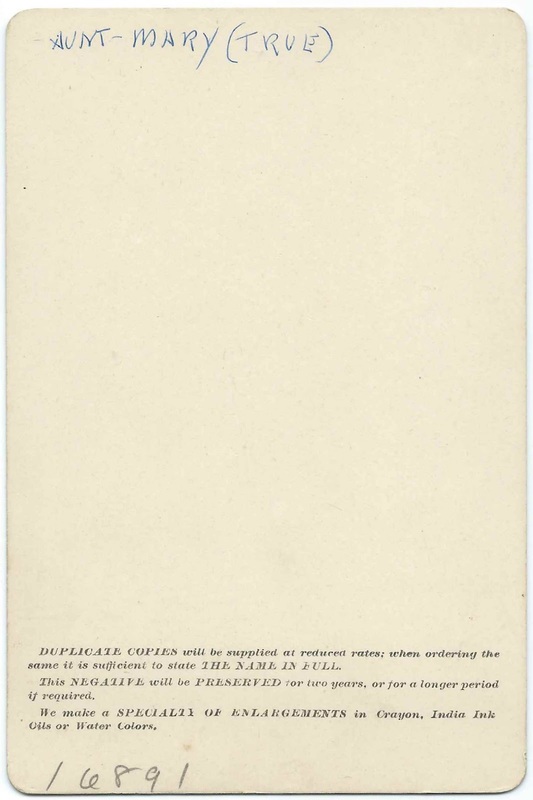 Deed signed on August 1, 1871 where Benjamin Dodge, Jr., of Bridgton, Maine, purchased a parcel of land in Bridgton from Abi Smith of Denmark, Maine. 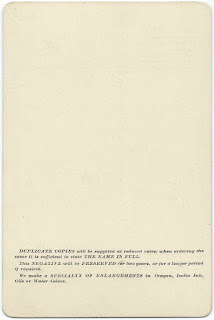 The deed was signed by Abi Smith in the presence of Justice of the Peace S. M. Harmon, and was recorded on January 4, 1887 in the Cumberland County Registry of Deeds by Register Storer S. Knight. 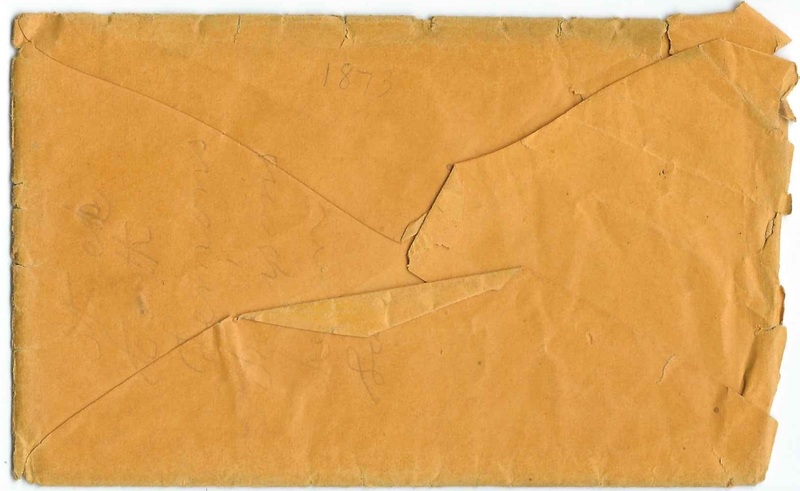 Perhaps a reader will have a theory on why the deed was not recorded until 1887. The parcel is described as part of lot numbered seven in the thirteenth range of lots in Bridgton; the parcel abuts land owned by F. J. Littlefield, or F. I. Littlefield, and Fogg & Billings. 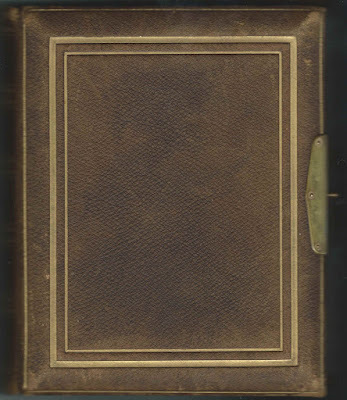 Genealogical and family history of the state of Maine, Volume II, compiled by George Thomas Little, 1857-1915; Henry Sweetser Burrage; and Albert Roscoe Stubbs, published in 1909. Abi Smith was presumably Abi (Trumbull) Smith, born at Rumford, Maine, on April 16, 1832, daughter of Joseph Trumball [or Trumbull] and Hannah (Howe) Trumball/Trumbull. She was the widow of Andrew H. Smith. Abi died at Denmark, Maine, from a fall and pneumonia, on January 27, 1916. 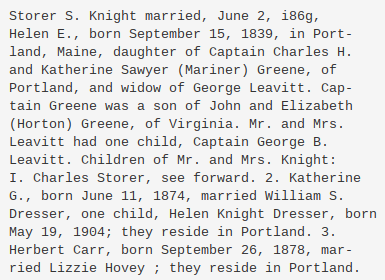 This information is gleaned from her Maine birth record, compiled from an old record, and her death record. 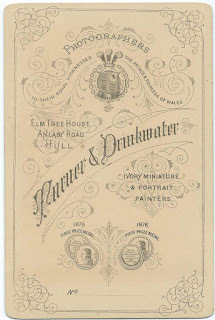 On March 25, 1849 at Denmark, Maine, Abi married Andrew H. Smith, son of Abner Smith and Fannie (Howe) Smith. Andrew was born about 1830. Abi and Andrew had, I believe, four children: Hannah; Joseph; Rosabelle; and Andrew. 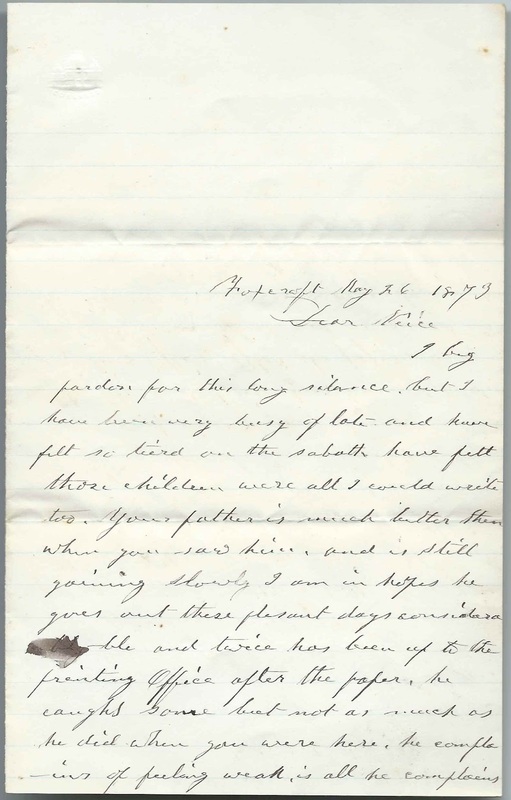 Andrew, the father, enlisted as a private in Company K of the 20th Maine Infantry Regiment on August 29, 1862 and mustered out on June 15, 1865. He died not long after the war, in 1867 and is buried in the Denmark Village/Berry Cemetery at Denmark, Maine, with Abi, who, as noted above, died in 1916 and daughter Rosabelle, who died in 1879 at the age of 19. Whether Andrew was debilitated from his war service or died from another cause, I don't know. 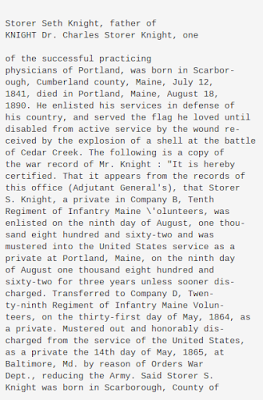 Benjamin Dodge, Jr., may have been the Benjamin Dodge, also a Civil War veteran, who was born at Portland, Maine, about 1821, son of Benjamin Dodge and Mary (Woodbury) Dodge, who were both natives of Beverly, Massachusetts. Benjamin died of chronic interstitial nephritis on November 26, 1901 at Bridgton, Maine and is buried with family members in the High Street Cemetery at Bridgton, Maine. Benjamin, Jr., married twice, I believe: 1) Joanna Pratt Titus, whom he married about 1844 and with whom he had 5 children, only two of which, Charles Benjamin Dodge and Frank Woodbury Dodge, survived to adulthood; 2) Mary Whiting, whom he married October 25, 1866 at Bridgton, Maine and with whom he had one son, John Everett Dodge. 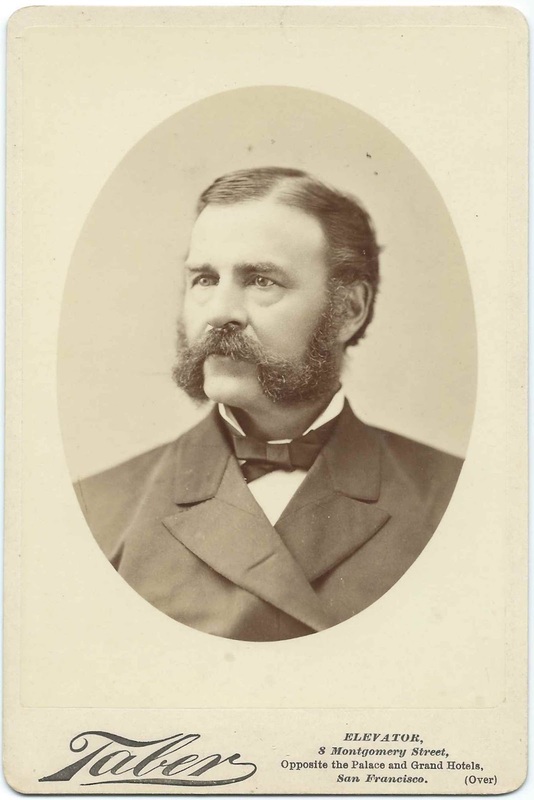 S. M. Harmon, Justice of the Peace, was presumably Bridgton, Maine, attorney Sherburne M. Harmon, who was born about 1831 in New Hampshire and later lived at Bridgton, Maine. His parents were, I think, Moses and Betsey (Harmon) Harmon. Sherburne married Eliza J. Davis, who was also born about 1830, possibly the daughter of Richard and Nancy Davis of Bridgton, Maine. Sherburne died in 1877 and Eliza in 1888. They're buried in the High Street Cemetery at Bridgton, Maine. I don't believe they had any children. 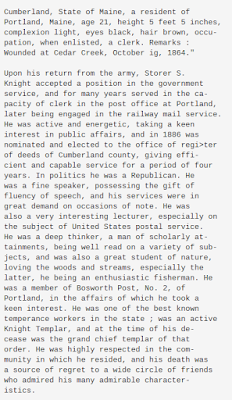 Storer S. Knight, Register of Deeds for Cumberland County, Maine, who recorded the deed in 1887, was Storer Seth Knight, born July 12, 1841 at Scarborough, Maine, son of Josiah Knight and Sarah (Bangs) Knight. He served in the Civil War and was wounded in the battle of Cedar Creek in 1864. 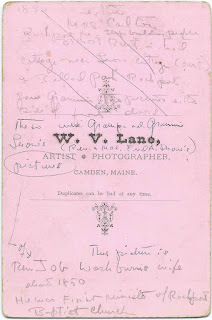 On June 2, 1869 at Portland, Maine, Storer married Helen Elizabeth Green, daughter of Charles and Catherine Green. Helen was the widow of George Washington Leavitt, who died in the Battle of Bull Run in 1862. Helen had one child from her first marriage and three children from her marriage to Storer Seth Knight. 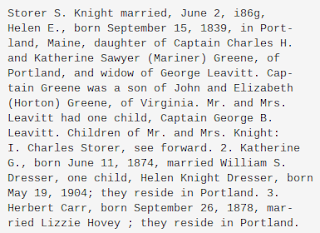 Storer Seth Knight and Helen Elizabeth (Green) Knight are buried in Evergreen Cemetery at Portland, Maine. 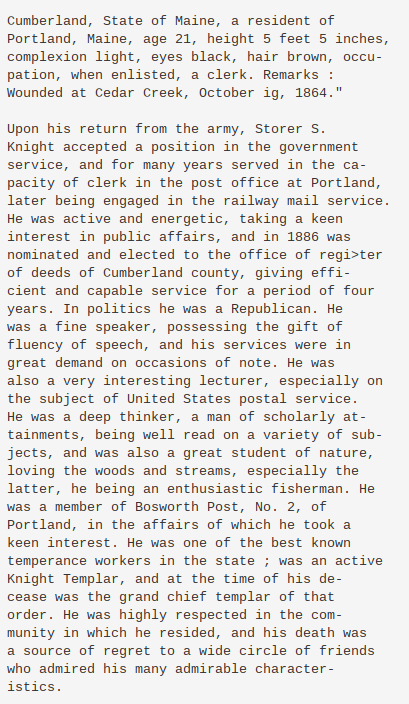 The excerpt below is taken from Genealogical and family history of the state of Maine, Volume II, compiled by George Thomas Little, 1857-1915; Henry Sweetser Burrage; and Albert Roscoe Stubbs, published in 1909. 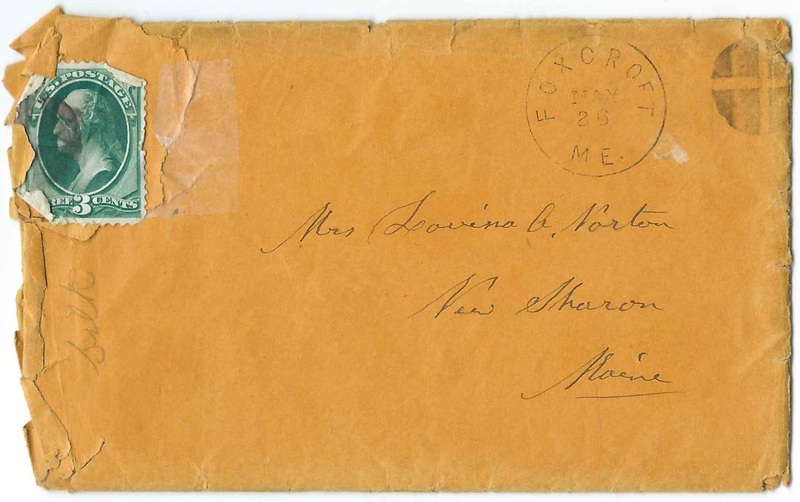 Four letters addressed to Mrs. Lovina Ann (Hodgkins) Stinchfield Norton (1833-1900) at New Sharon, Maine, widow of Hiram Adison Stinchfield (1832-1853) and Benjamin Norton (1833-1862). 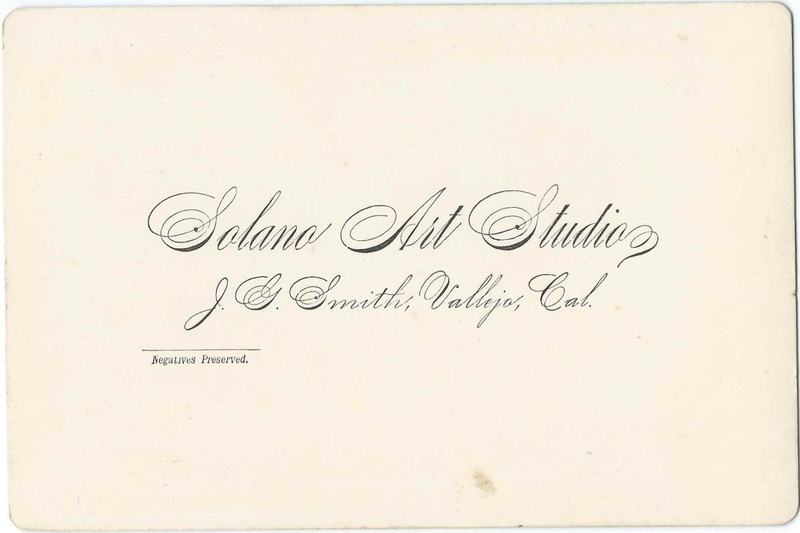 Images and transcriptions at the end of this post. Letter #1 : postmarked Foxcroft, Maine, dated May 26, 1873. 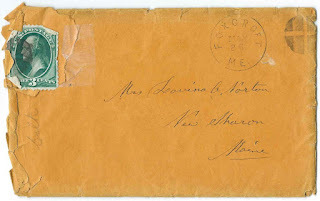 From "Aunt Dearborn", presumably Dorothy J. 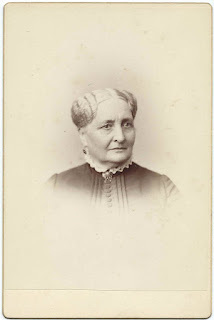 (Hodgkins) Dearborn (1816-1891), wife of Franklin Dearborn (1812-1889) and sister of Lovina's father Abel Hodgkins (1807-1874), who was residing with the Dearborns at the time the letter was written. 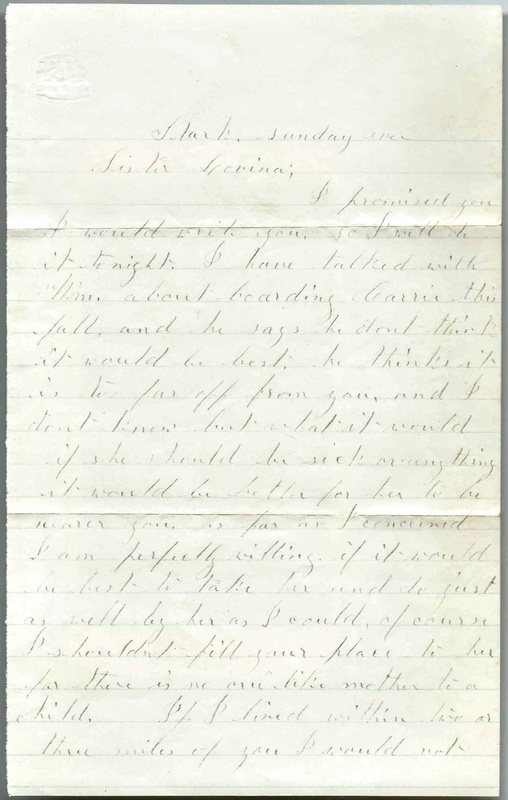 The letter would have been a grim read for Lovina, as it contains news of the poor health and spirits of Lovina's father and her aunt and uncle. Letter #2 : postmarked North Boothbay, Maine; dated July 15, no year written, but, from the content, sometime between 1866 and 1875, since it mentions daughter Nellie Maria Toothaker, who was born in 1866, and Rev. Toothaker, who died in 1875. 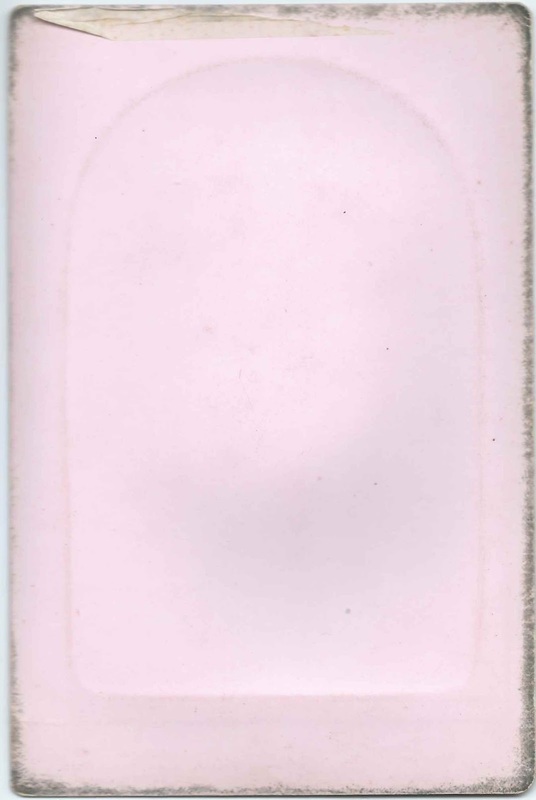 From Lucy Mehitable (Richards) Toothaker (1835-1914) , wife of Rev. 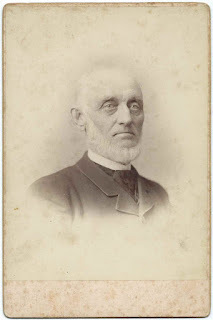 Horace Toothaker (1833-1875), past minister at New Sharon, Maine. Lucy, and her husband, who was ailing, and daughter Nellie were visiting at North Boothbay, Maine, where they had formerly lived. 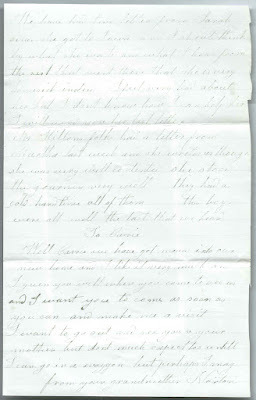 Lucy mentions Lovina's loss and loneliness, presumably referring to the 1862 death of her second husband Benjamin Norton, who died during Civil War service at Washington, D.C., in 1862, or perhaps to the death of Lovina's mother Hannah (Tilton) Hodgkins (1813-1866) on February 21, 1866. 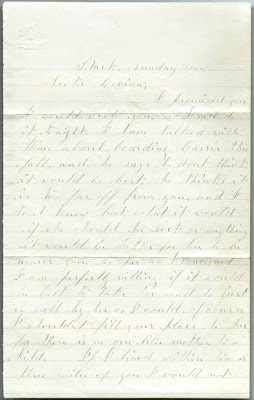 Letter #3: Starks, Maine; undated - from "Sister Mary", who was presumably Mary (Norton) Snell (1833-1921), wife of William Greenleaf Snell (1824-1907) and sister of Lovina's second husband Benjamin Norton (1833-1862). 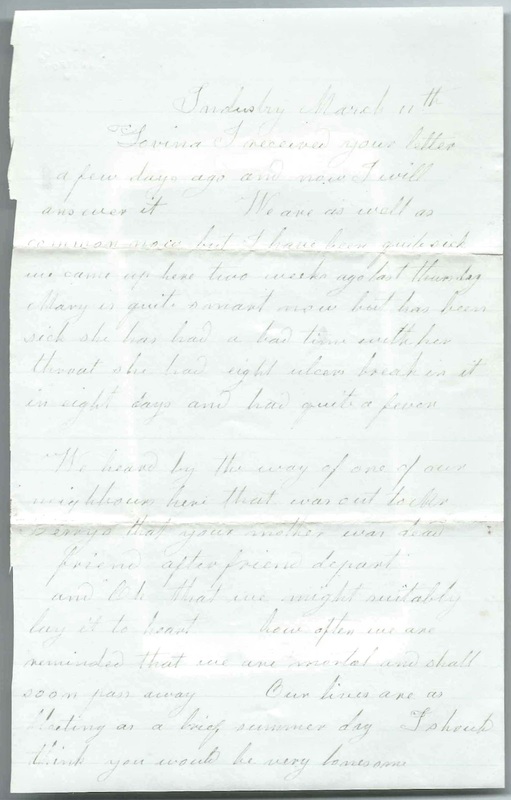 Apparently Lovina had asked Mary to board Lovina's daughter Carrie May Norton, but Mary and her husband William feel they must decline, presumably because of the state of Carrie's health. 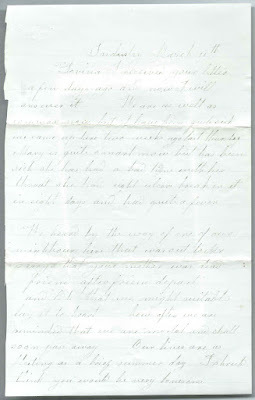 The letter also mentions Jennie, presumably Mary's daughter Jennie Snell (1863-1945), and Orintha, presumably William's sister Orintha M. Snell (1835-1889). Letter #4: West Mills, Industry, Maine, March 18, no year, but presumably 1866 as it mentions the recent death of Lovina's mother Hannah Tilton, who died in February 1866. 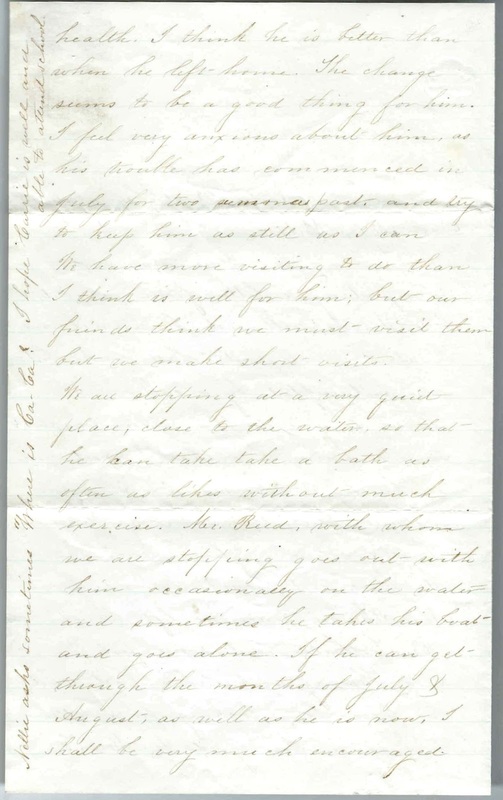 From Caroline (Smith) Norton (1807-1886), mother of Lovina's second husband Benjamin Norton (1833-1862); Caroline directed a portion of her letter to granddaughter Carrie May Norton. 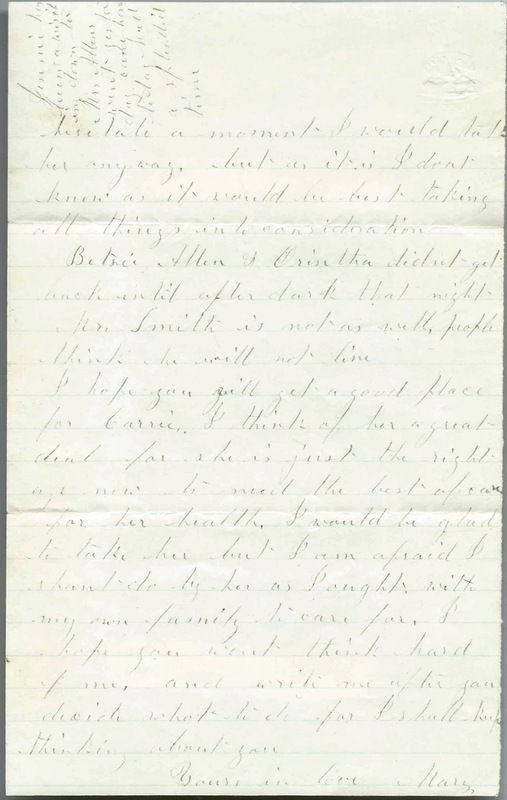 The letter mentions family members moving west, and records show that some of Caroline's family members moved to Waverly, Iowa, where Caroline herself died in 1886. 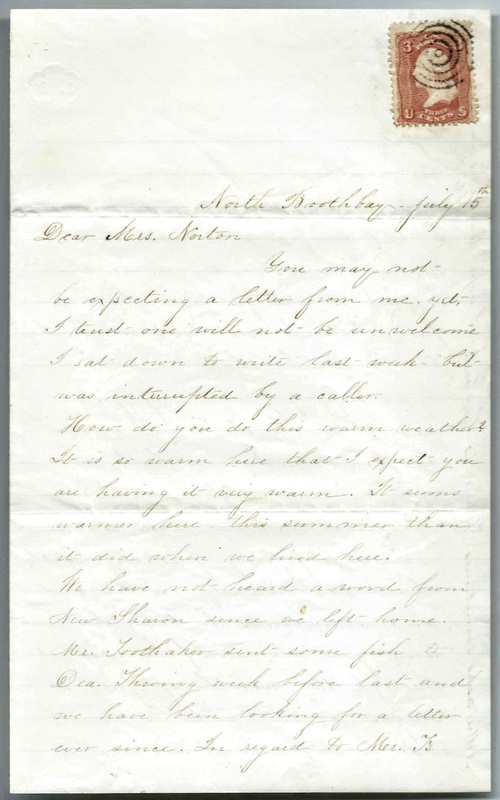 Mr. Berry, presumably of Industry, Maine; mentioned in letter of Caroline (Smith) Norton, mother of Lovina's second husband Benjamin Norton. Mr. Smith, presumably of Starks, Maine; mentioned in letter of Mary (Norton) Snell of Starks, Maine. Mr. Smith was very ill and not expected to live. Jennie, presumably Jennie F. Snell (1863-1945); mentioned in letter of Mary (Norton) Snell of Starks, Maine; daughter of William Greenleaf Snell and Mary (Norton) Snell, who was the sister of Lovina's second husband Benjamin Norton. 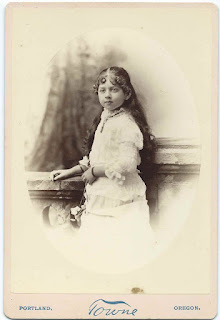 Lenora May West, daughter of Dr. Pliny Hume West and Carrie May (Norton) West; Lovina's granddaughter. Lenora would marry Edwin F. Lincoln of Brockton, Massachusetts. 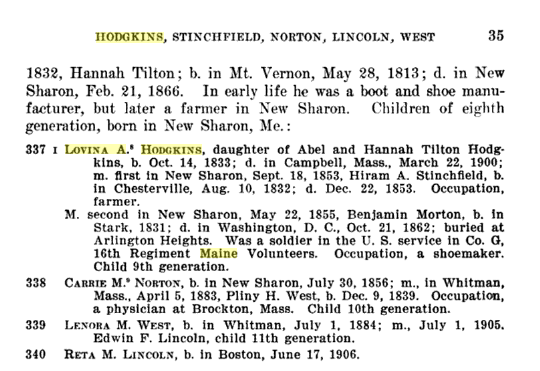 Lovina Ann (Hodgkins) Stinchfield Norton (1833-1900) was born at Vienna, Maine, on October 14, 1833, daughter of Abel Hodgkins (1807-1874) and Hannah (Tilton) Hodgkins (1813-1866). 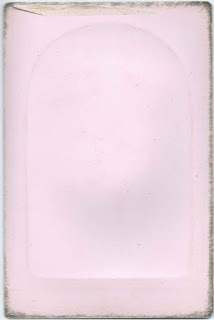 Hannah died in 1866. 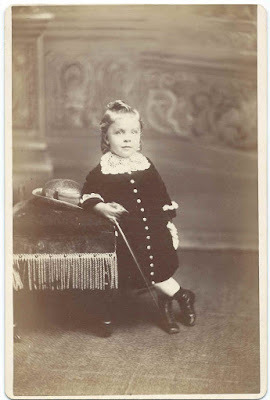 Abel died February 21, 1874 at Foxcroft, Maine, where he was living with his sister Dorothy J. 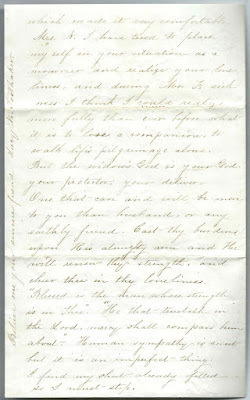 (Hodgkins) Dearborn (1816-1891), who wrote one of the letters, which contains information about Abel's health. 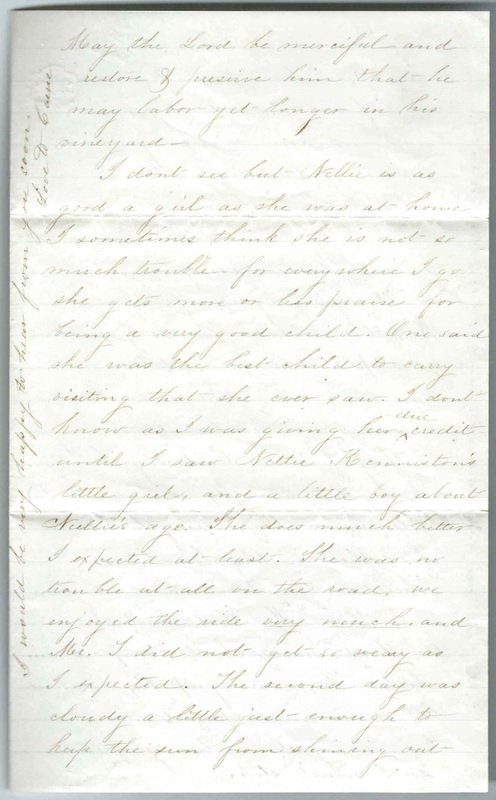 Lovina survived two husbands: 1) Hiram Adison Stinchfield (1832-1853) and 2) Benjamin Norton (1833-1862). 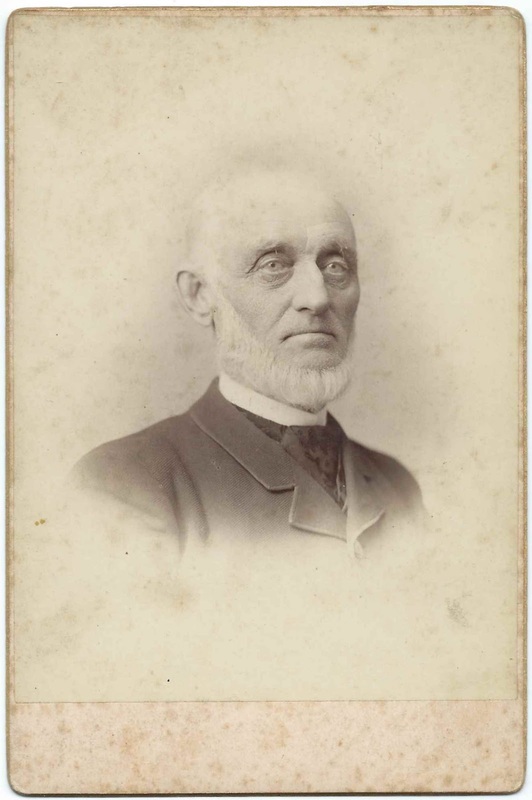 Hiram Adison Stinchfield was born August 10, 1832 at Chesterville, Maine, son of Benjamin and Sarah (Whittier) Stinchfield. 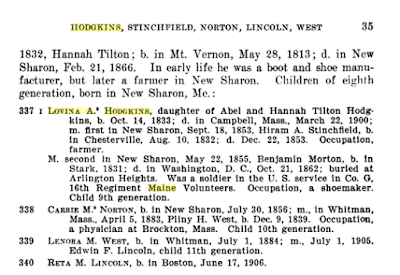 Lovina and Hiram married on September 18, 1853 at New Sharon, Maine. Sadly, Hiram died a few months after his marriage, on December 22, 1853. I don't think any children resulted from this marriage. 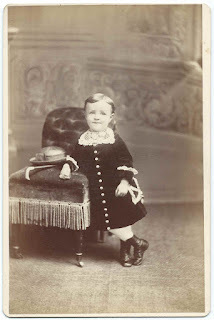 Benjamin Norton (1833-1862) was born about 1833 at Starks, Maine, son of David Merry Norton and Caroline (Smith) Norton [Caroline wrote one of the letters]. 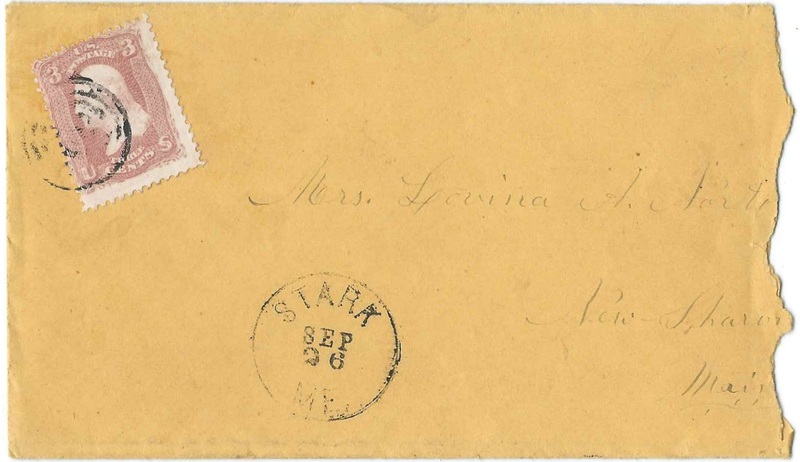 Lovina and Benjamin married on May 22, 1855 at New Sharon, Maine. 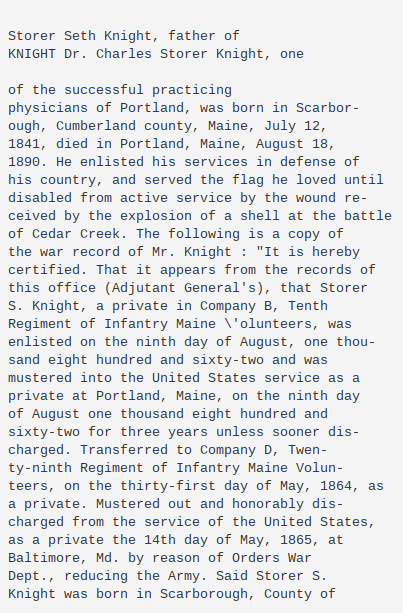 Benjamin enlisted in Company G of the Sixteenth Maine at New Sharon, Maine, on July 22, 1862 and, sadly, died a few months later, on October 21, 1862. He's buried in the US Soldiers and Airmen's Home National Cemetery at Washington, D.C. Lovina and Benjamin had a daughter, Carrie May Norton (1856-1917) born July 30, 1856 at New Sharon, Maine. 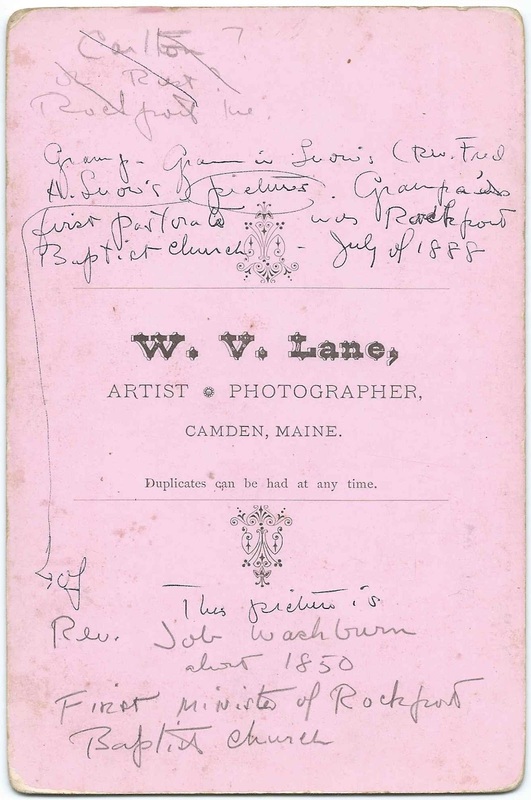 Carrie May Norton, who is implied as sickly in the letters, would marry Dr. Pliny Hume West (1839-after 1922) at Whitman, Massachusetts, on April 5, 1883. 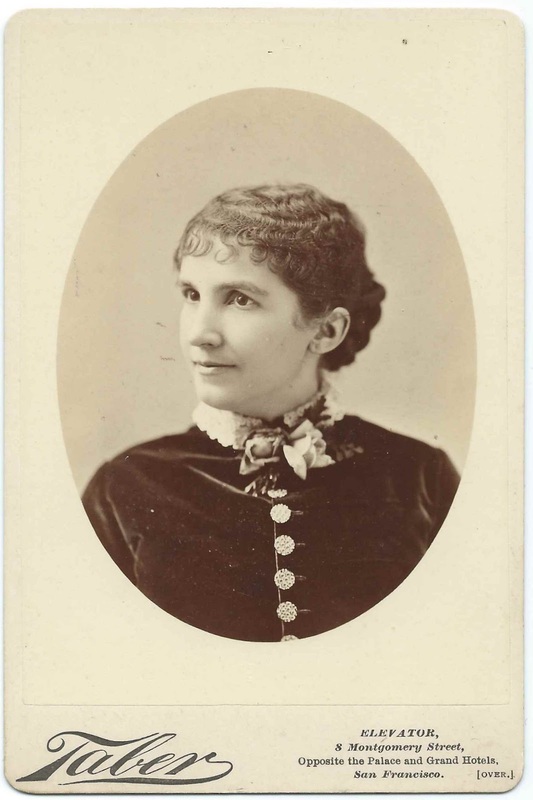 Dr. West had previously been married to Carrie's maternal aunt, Hannah Jennie (Hodgkins) West, who died in 1881, leaving at least two children. 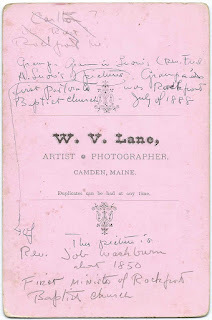 Dr. West and Carrie had a daughter Lenora May West, born at Whitman, Massachusetts, on July 1, 1884. 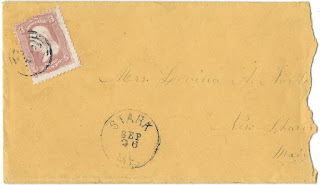 Lenora would marry Edwin F. Lincoln of Brockton, son of Frederick W. Lincoln and Sarah Jane (Cummings) Lincoln. Carrie indicated to the 1900 Census enumerator that she was divorced and had been married for only one year, so presumably she and Dr. Pliny Hume West divorced about 1884 or 1885. I don't believe she ever remarried. Dr. Pliny Hume West married Elizabeth Bennett in 1906. 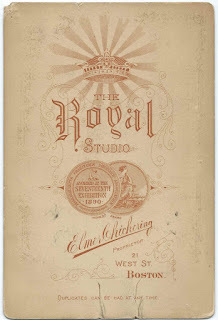 In 1922 he was preparing to marry his fourth wife, Mrs. Julia O. 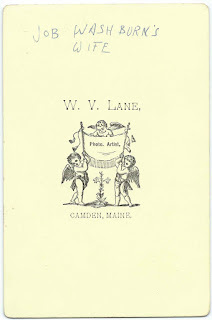 Young; apparently an article in the Brockton, Massachusetts paper got picked up by papers all over the country, with various lurid headlines, such as "Aged Pair, Much Married, Like Gay Life". At some point before 1900, Lovina moved to Massachusetts, presumably to be with her daughter Carrie. Lovina died at Campello, Massachusetts, or Brockton, Massachusetts, on March 22, 1900 and is buried with Carrie, who died in 1917, in the Melrose Cemetery at Brockton. 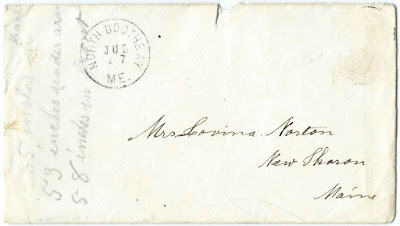 Letter # 1 - sent from Foxcroft, Maine, dated May 26, 1873 and written by "Aunt Dearborn", presumably Dorothy J. (Hodgkins) Dearborn, wife of Franklin Dearborn and sister of Lovina's father Abel Hodgkins, who was residing with the Dearborns at the time of this letter. I beg pardon for this long silence, but I have been very busy of late and have felt so tired on the Sabbath, have felt those children were all I could write to. Your father is much better than when you saw him and is still gaining slowly. 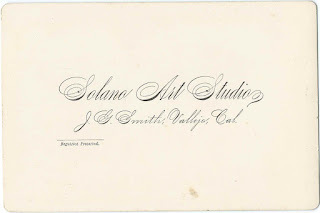 I am in hopes he goes out thedse pleasant days considerable and twice has been up to the printing Office after the paper. He coughs some but not as much as he did when you were here. He complains of feeling weak, is all he complains of now. I am in hopes he will be able to visit you this summer for I think it would do him good to have a change to raise him a little. I am so near worn out that I feel I am of little account anyway. I would like to go to Kennebec this summer but times are so hard and money so scarce with me I feel I cannot afford to go. I have not got a chance to sell my farm yet and fear I shan't find a chance this season, but want to very much. Your father never says anything about going or staying, therefore don't know what his mind is. His appetite is good, is looking much better and I feel if he would exert himself a little he would gain in strength much faster than he does, but he don't seem to want to bestir himself at all. and I don't feel to drive him up as I would were he younger. Your Uncle Frank has been lame with Rheumatism in one foot and had a ? [looks like fellon] on his hand since I last wrote you, has a bad looking finger now but is better. He goes out of late some with his cart. I finished house cleaning yesterday and don't feel I have not had a hard chance, will you. For I can tell you I have in good faith, I am so lame today I can scarcely move. I feel at time my load must be lightened or I must break under it. But I must hasten as I must write to some of those children yet today. If your father knew of my writing he would send love but as he is napping it will not not disturb him. Accept much love from us all for yourself and all the rest and write us soon. We feel anxious to know if you go to Waterville to live. Let us know, please, your plans for the future. God Bless you all is the prayer of your Aunt Dearborn. 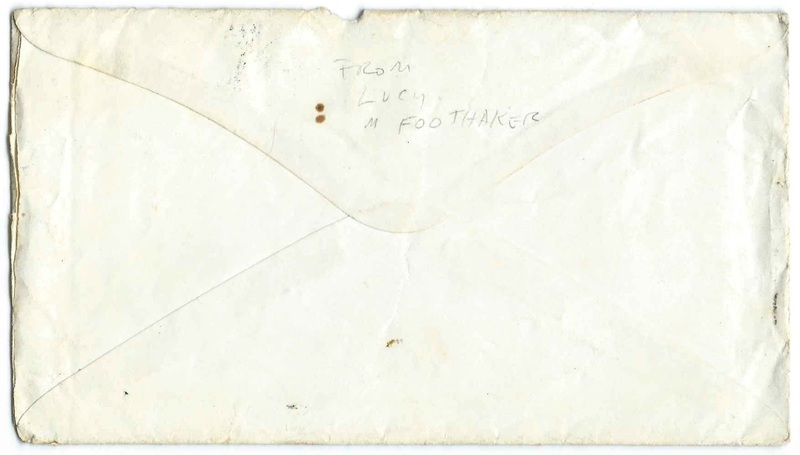 Letter #2 - North Boothbay, Maine; undated - from Lucy Mehitable (Richards) Toothaker , wife of Rev. 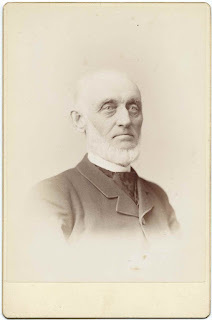 Horace Toothaker, former minister at New Sharon, Maine. 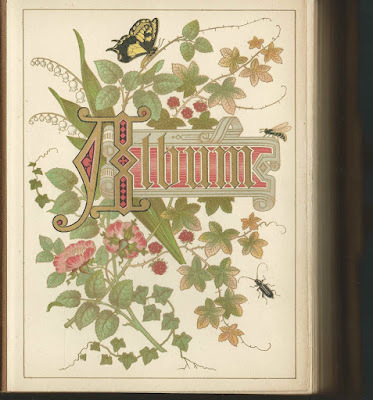 Lucy was writing upon the occasion of Lovina's loneliness, possibly caused by a recent event or one in the past, such as the death of her mother in February 1866 or the deaths of her late husbands in the past. The letter was after daughter Nellie's birth in 1866 and before the death of Rev. Toothaker, on March 1, 1875. 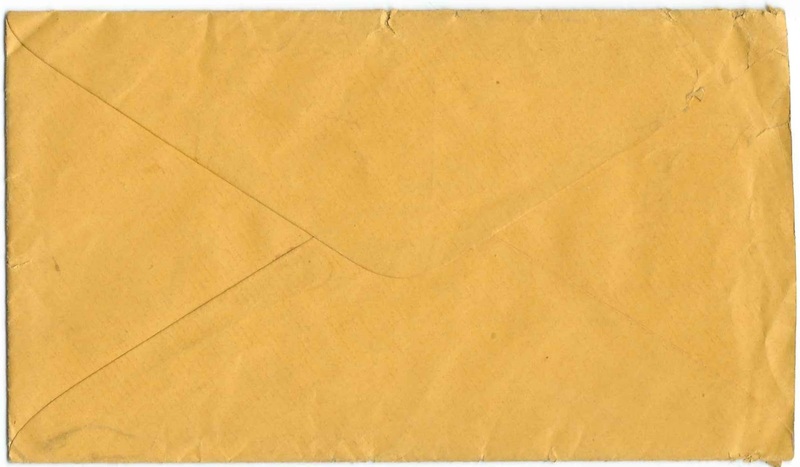 You may not be expecting a letter from me, yet I trust one will not be unwelcome. I sat down to write last week but was interrupted by a caller. Howe do you do this warm weather? It is so warm here that I expect you are having it very warm. It seems warmer here this summer than it did when we lived here. We have not heard a word from New Sharon since we left home. Mr. Toothaker sent some fish to Dea. 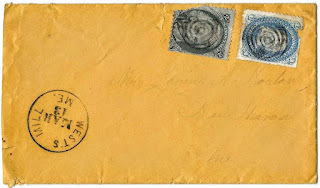 Thwing week before last and we have been looking for a letter ever since. In regard to Mr. T's health, I think he is better than when he left home. The change seems to be a good thing for him. I feel anxious about him as his trouble has commenced in July for two summers past and try to keep him as still as I can. We have more visiting to do than I think is well for him, but our friends think we must visit them, but we make short visits. We are stopping at a very quiet place, close to the water, so that he can take a bath as often as likes without much exercise. Mr. Reed, with whom we are stopping, goes out with him occasionally on the water and sometimes he takes his boat and goes alone. If he can get through the months of July &amp; August, as well as he is now, I shall be very much encouraged. 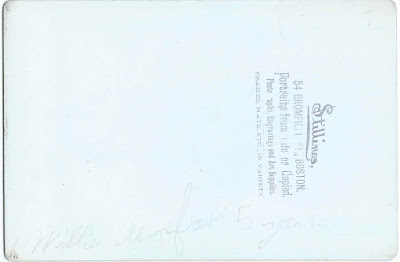 [Written sideways on the left margin: Nellie asks sometimes, "Where is Ca Ca?" I hope Carrie is well and able to attend school.] May the Lord be merciful and restore and preserve him that he may labor yet longer in his vineyard. I don't see how but Nellie is as good a girl as she was at home. I sometimes think she is not so much trouble for everywhere I go she gets more or less praise for being a very good child. One said she was the best child to carry visiting that she ever saw. I don't know as I was giving her due credit until I saw Nettie Kenniston's little girl and a little boy about Nellie's age. She does much better, I expected at least. She was no trouble at all on the road. We enjoyed the ride very much and Mr. T. did not get so weary as I expected. The second day was cloudy a little just enough to keep the sun from shining out. [Written sideways along the left margin: I would be very happy to hear from you soon. Love to Carrie.] which made it very comfortable. 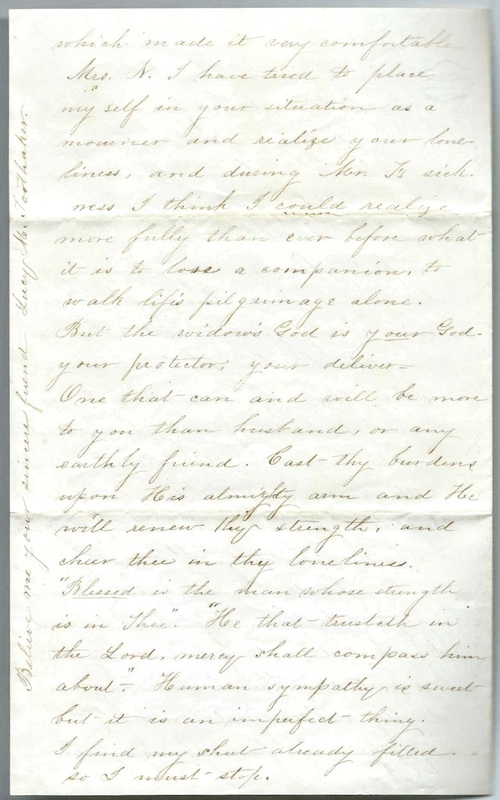 Mrs. N, I have tried to place myself in your situation as a mourner and realize your loneliness, and during Mr. T's sickness I think I could realize more fully than ever before what it is to lose a companion, to walk life's pilgrimage alone. But the widow's God is your God, your protector, your deliver[er]. One that can and will be more to you than husband, or any earthly friend. Cast thy burdens upon His almighty arm and He will renew thy strength, and cheer thee in thy loneliness. "Blessed is the man whose strength is in Thee." "He that trusteth in the Lord's mercy shall compass him about." Human sympathy is sweet but it is an imperfect thing. I find my sheet already filled, so I must stop. 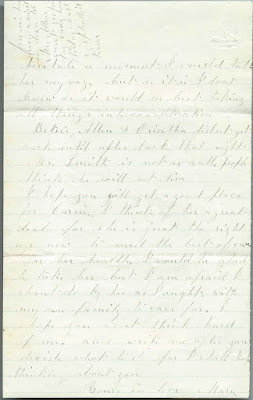 Letter # 3 - Starks, Maine; undated - from "Sister Mary", who was presumably Mary (Norton) Snell, wife of William Snell and sister of Lovina's second husband Benjamin Norton. 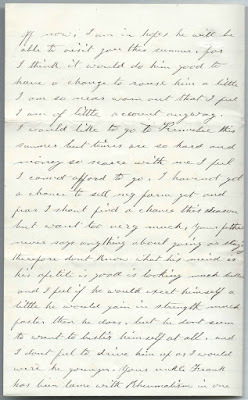 Mary and William have decided that boarding Lovina's daughter Carrie May Norton would not be for the best, presumably due to Carrie's ill health and the distance between the Snell and Norton households. I promised you I would write you so I will do it tonight. I have talked with Wm. about boarding Carrie this fall, and he says he don't think it would be best. He thinks it is too far off from you and I don;t know but what it would. If she should be sick or anything. it would be better for her to be nearer you as far as I concerned. I am perfectly willing if it would be best to take her and do just as well by her as I could. Of course I shouldn't fill your place to her for there is no one like mother to a child. If I lived within two or three miles of you I would not hesitate a moment. I would take her anyway but as it is I don't know as it would be best taking all things into consideration. Bertie Allen &amp; Orintha didn't get back until after dark that night. Mr. Smith is not as well. People think he will not live. I hope you will get a good place for Carrie. I think of her a great deal for she is just the right age now to need the best of care for her health. I would be glad to take her but I am afraid I shan't do by her as I ought with my own family to care for. I hope you won't think hard of me and write me after you decide what to do for I shall keep thinking about you. 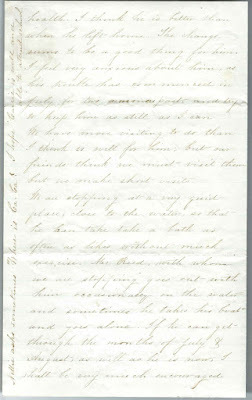 Letter # 4 - West's Mill, Maine; dated March 11 at Industry, Maine; written presumably in 1866, as the letter mentions the recent death of Lovina's mother, Hannah (Tilton) Hodgkins (1813-1866), who died on February 21, 1866. 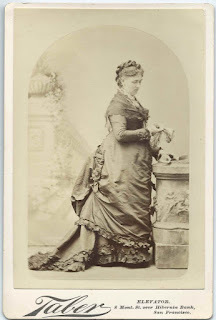 From Caroline (Smith) Norton (1806-1886), mother of Lovina's second husband Benjamin Norton (1833-1862). Caroline mentions family members who have moved West; Caroline joined them at some point; she died in 1886 at Waverly, Iowa. 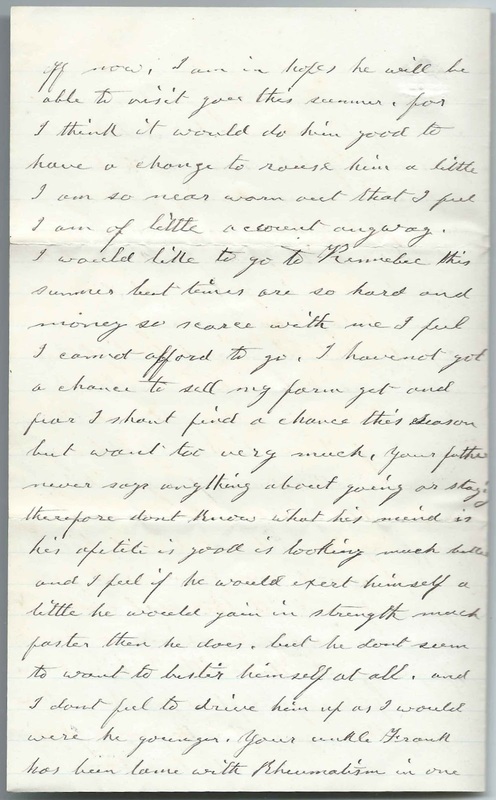 A portion of the letter is directed to Caroline's granddaughter Carrie May Norton. 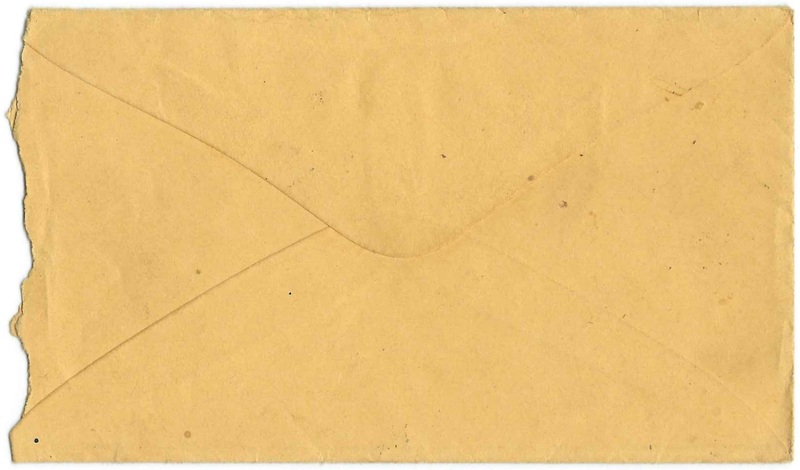 October 31, 1904 letter from Rev. Thomas Guy Langdale, a Congregational minister at Epping, New Hampshire, to his cousin Belle. 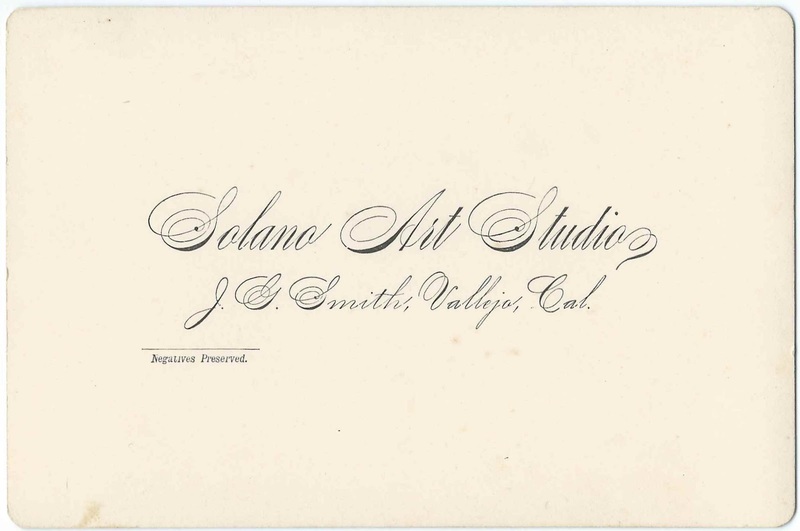 The letter consists of one sheet, approximately 9" by 5-3/4", with both sides used. 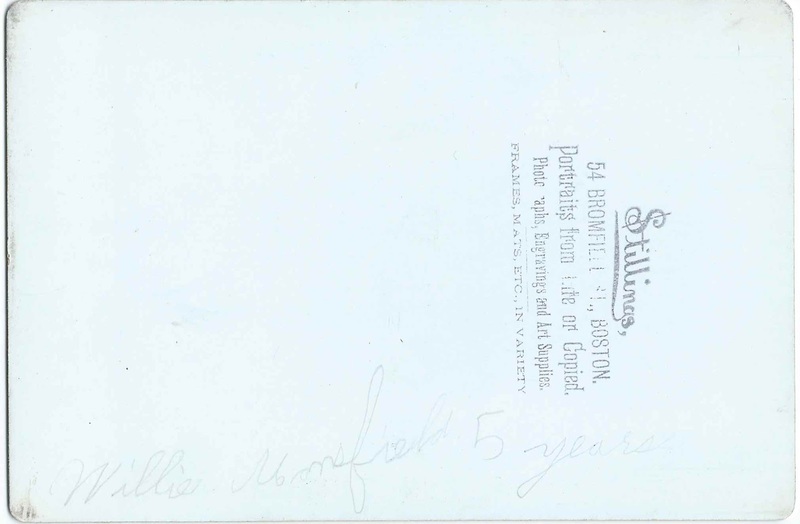 It's addressed to Cousin Belle and mentions "Mother" [presumably Rev. Langdale's mother Harriet Isabel (Megrue) Langdale, but possibly his mother-in law Mary Jane (Fowles) Pearce]; and "Cousin Helen". Thomas Guy Langdale was born at Cincinnati, Ohio, about October 1866, the son of Robert Hill Langdale and Harriet Isabel (Megrue) Langdale. Rev. Langdale graduated from the University of Cincinnati in 1887 and Chicago Theological Seminary in 1891. 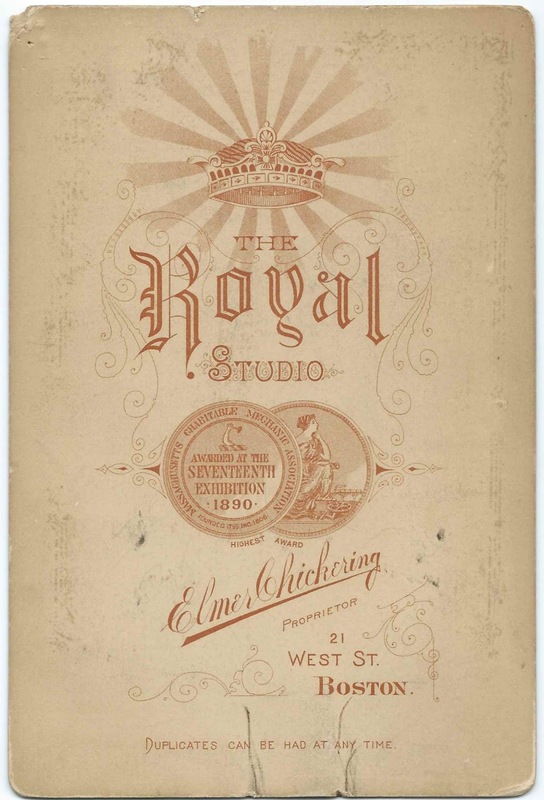 Before Epping, New Hampshire, he ministered at Clark, South Dakota and in the Boston, Massachusetts area. 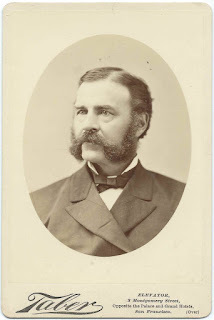 After his term at Epping, he returned to Massachusetts, at Salem, Haverhill and Lawrence. 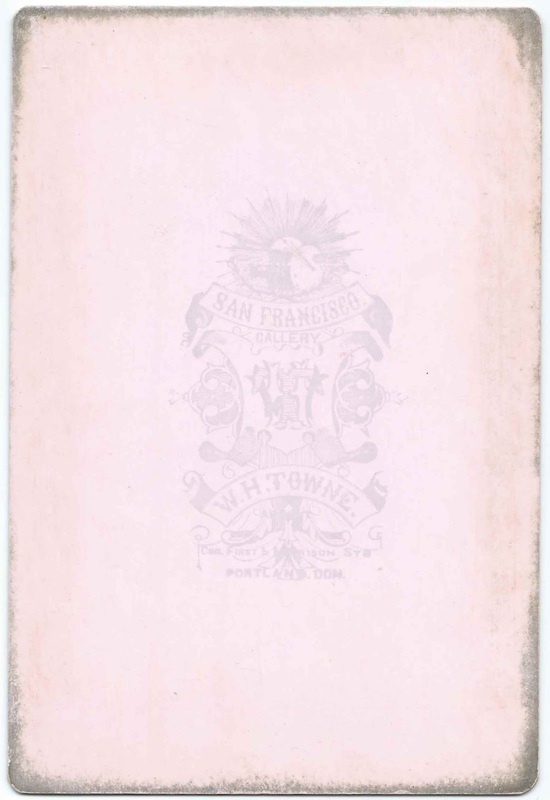 On January 15, 1902, Rev. 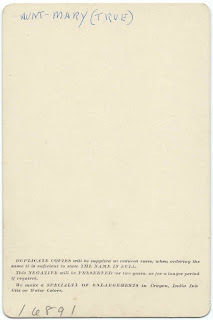 Langdale married Edith Houghton Pearce, daughter of Thomas H. Pearce and Mary Jane (Fowles) Pearce. Rev. 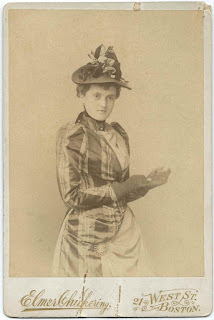 and Mrs. Langdale had at least one child, daughter Edith born in 1902. Rev. Langdale died before 1930 or early that year, as implied from the 1930 Census, in which Edith described herself as a widow. I haven't found his death date or his burial site. A pleasant but much appreciated surprise came to me with the return of Mother after her good visit with you in the books so kindly put into my hands for use until called for by Cousin Helen. I am particularly interested in reading books of the times represented by these which you send, partly because I have a natural liking for books that have the wisdom of years to commend them & partly because they give one an opportunity to see at first hand the forms great & abiding truths took in early days & to recognize how much we owe in the present to the thought & life of the past. Though I have Edwards Works in Four Volumes embracing both "The History of Redemption" & "The Religious Affections" & have read both of them through I am specially glad to have them in separate volumes - as I profess to be a great admirer of Jonathan Edwards. The other books so far as I know them at all, I know them by reputation & so value the possession of them all. Please tell Cousin Helen that we are very sorry she cannot arrange at the present time to make us a visit. When she is so situated that she can do so we hope she will let us know & we shall be glad to suit her convenience. All at the Epping Parsonage send best wishes to you and yours. 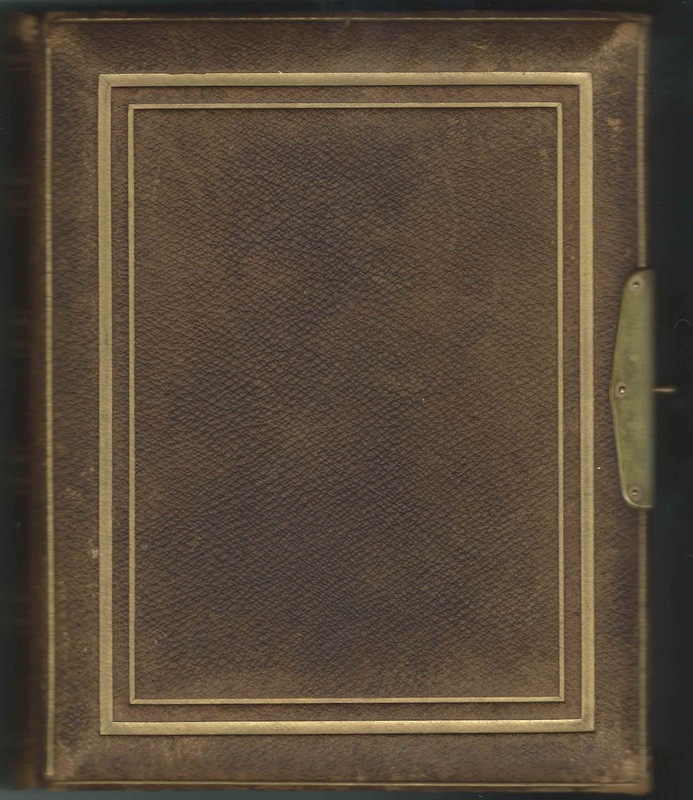 Photograph album given to Capt. Mrs. Talpey by D. Richard Johnson, presumably of Hull, England. Capt. 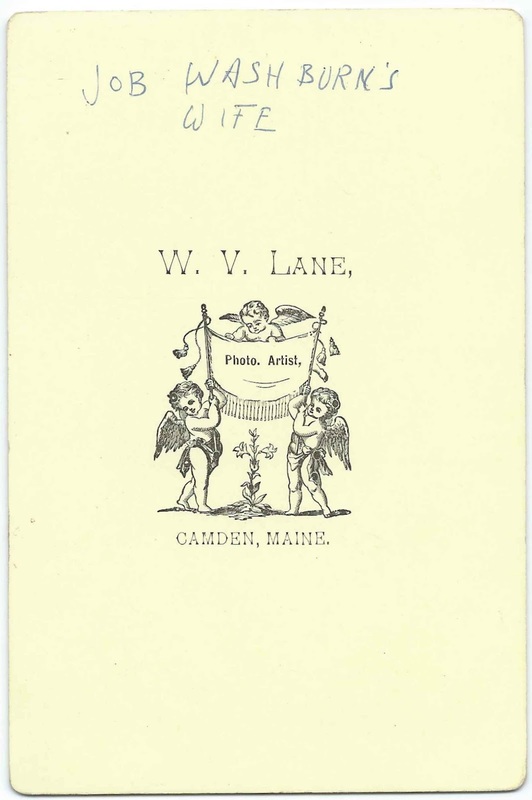 Mrs. Talpey was presumably Adelia Caroline (Carleton) Talpey, a native of Rockport, Maine, and wife of Sea Captain Henry Talpey. 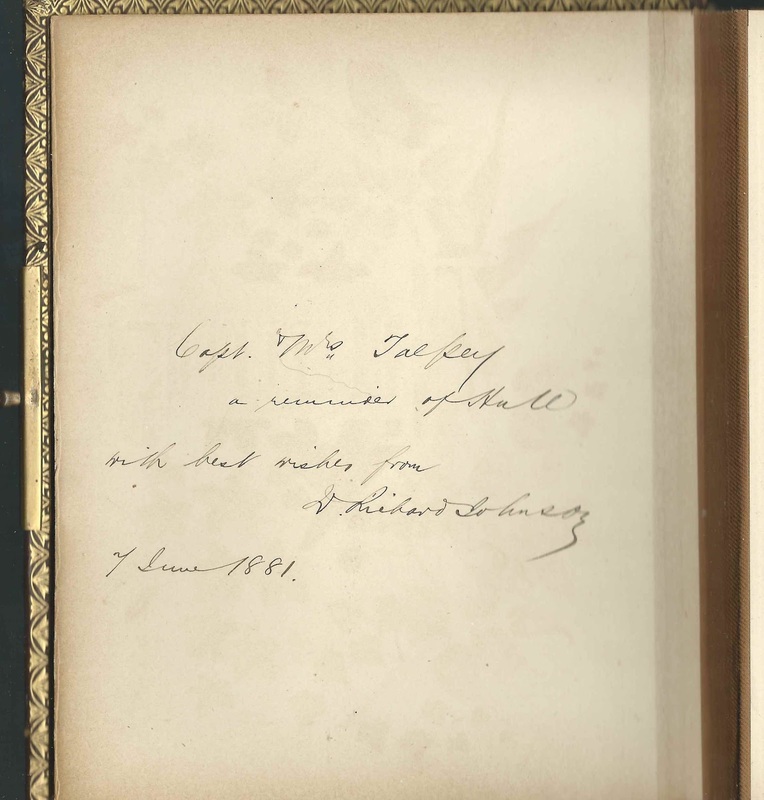 See another post that features the 1869-1880s autograph album of Adelia Caroline (Carleton) Talpey, with autographs collected around the world, including from people involved in the sailing trade from England, China and Pitcairn Island. 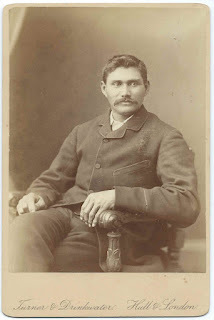 While at Pitcairn Island, the Talpeys befriended Ernest Harwood Christian and took him with them on a round-the-world voyage. 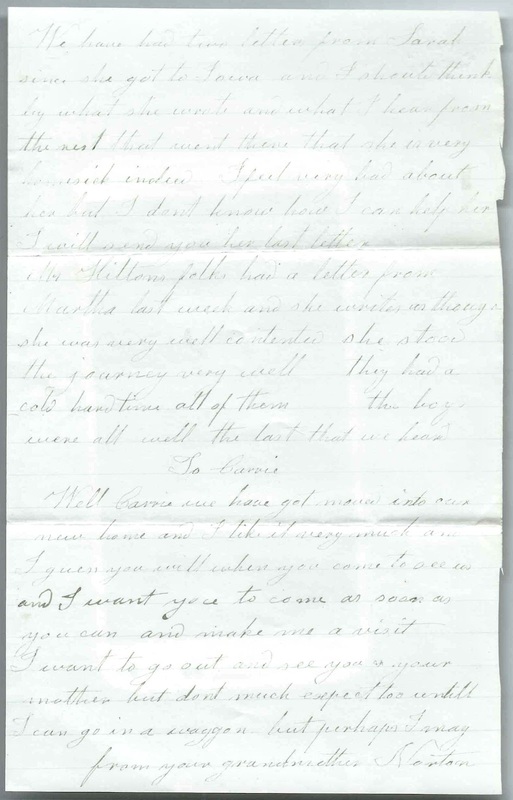 The post cited above also contains a brief genealogy of Adelia Caroline (Carleton) Talpey and Henry Talpey. 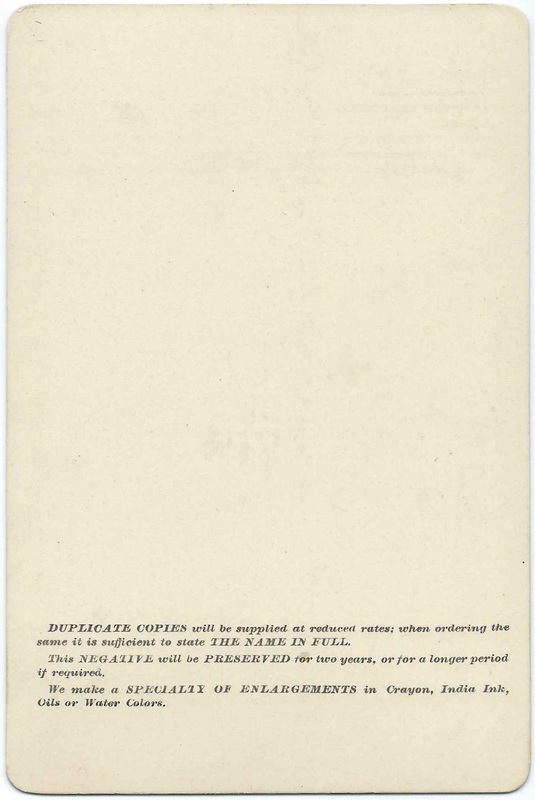 The album contains a scrap of family history and provenance written in the 1983. 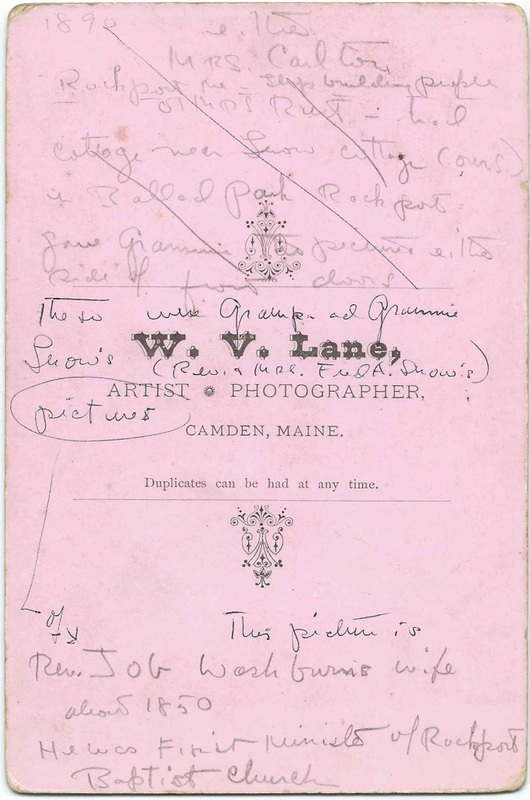 Whether or not the original photographs were removed and replaced by those of another family, as suggested in the handwriting, I don't know. 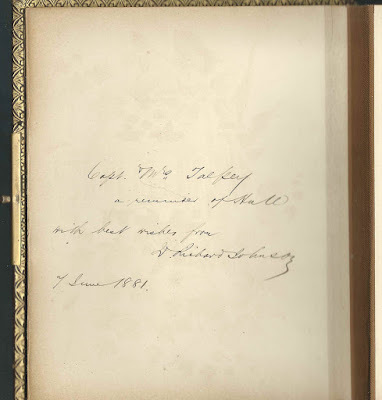 But the presence of the photographs of Betsey (Crowell) Carleton Washburn and the photograph taken at Hull, England, would seem to indicate otherwise, thankfully. Perhaps the photograph taken by the Turner and Drinkwater studio at Elm Tree House, Anlaby Road, Hull, England, depicts D. Richard Johnson himself. There are two photographs each of Rev. Job Washburn and second wife Betsey (Crowell) Carleton Washburn of Rockport, Maine. Betsey's first husband was William Carleton; she and William were the paternal grandparents of Adelia Caroline (Carleton) Talpey. Rev. Washburn, according to information written on the reverse of his photographs, was the first minister at the Rockport Baptist Church. The photographs of Rev. and Mrs. Washburn are identical but with different colored backs, as shown below. 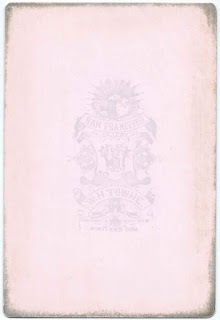 Another photograph, taken by the Taber studio in San Francisco on 8 Montgomery Street, depicts Aunt Mary (True). 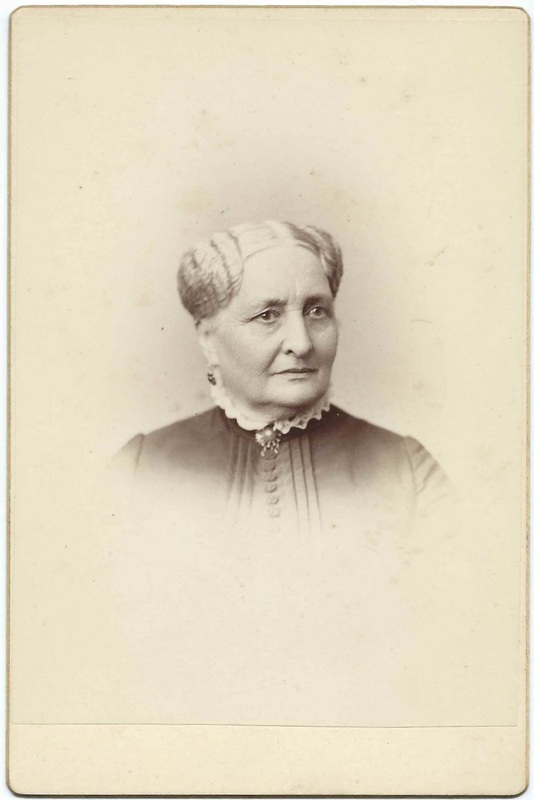 Her photograph is opposite that of a man of an age similar to hers and possibly her husband; sadly, his photograph is unidentified. 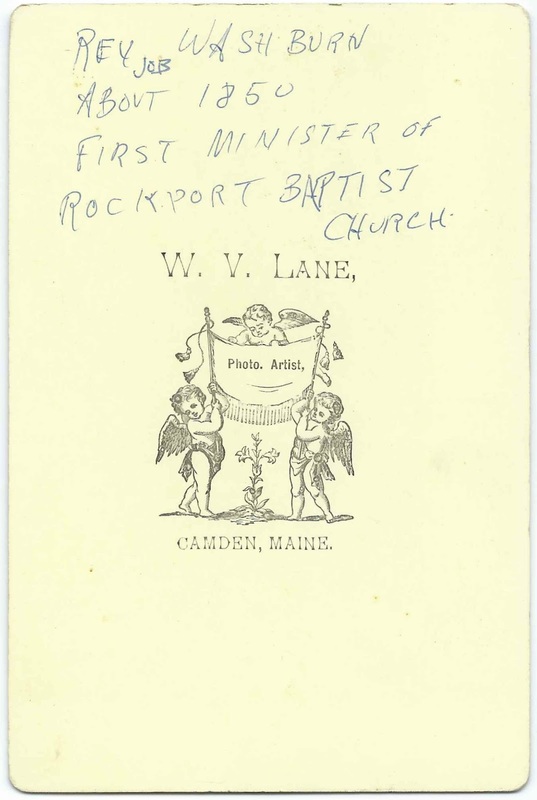 Hopefully a reader familiar with the genealogy of the Rockport, Maine, area, will recognize the couple and leave a comment with their identity. Another photograph was taken at the Taber studio, that of an older woman, perhaps the mother of Mary or her husband. 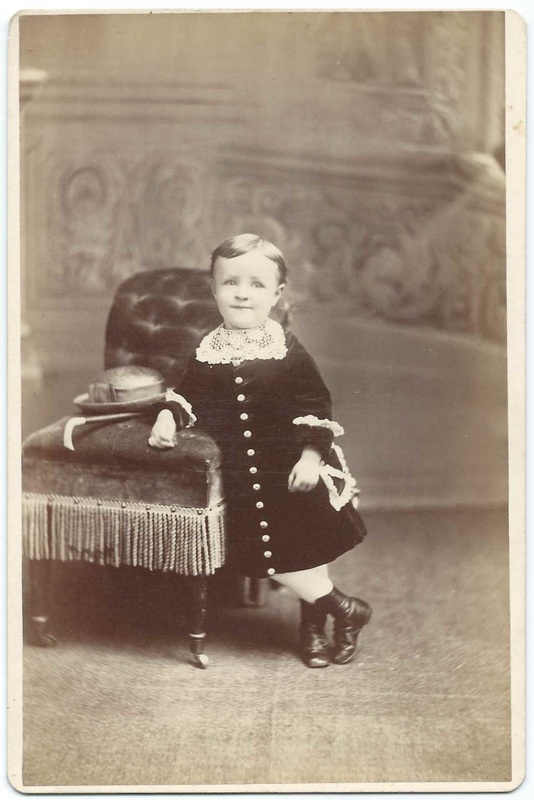 Another photograph, taken by the Stillings studio at 54 Bromfield Street, Boston, Massachusetts, depicts a 5 year old boy named Willie Mansfield. 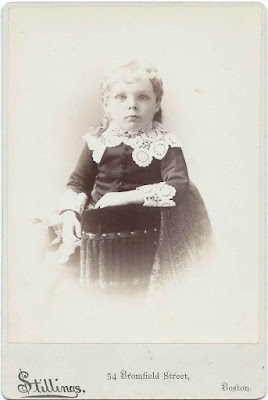 If you recognize any of these photographs from your family photographs and/or research, please leave a comment or contact me directly.